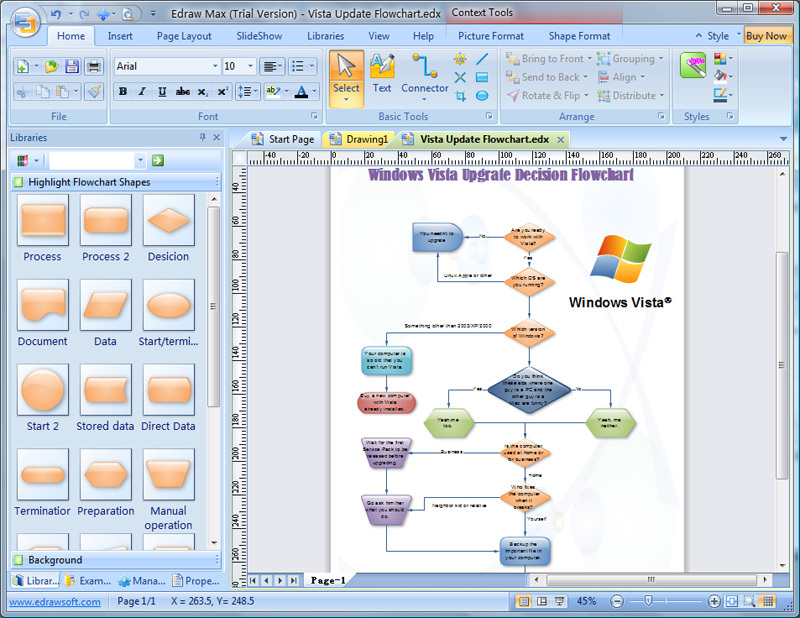 EDraw Flowchart Software Create flow diagrams and org charts with minimum time loss! O EDraw is a new flowchart software, which creates flowcharts and org charts with minimum time loss for you. Support basic flowcharts, organizational charts, business charts, hr diagram, work flowchart, programming flowchart and network diagrams. 1. Easy to Learn, Easy to Use. Drawing does not need to start anew. Just drag the ready-made shapes from the library pane and drop them on your page. Drawing couldn't be easier! 2. Rich pre-drawn templates. Include basic flowcharts, organizational charts, business charts, hr diagrams, work flowcharts, programming flowcharts, process flowcharts and network design diagrams. 3. Typical examples. Offer the examples storehouse to collect, manage various kinds of works of excellence. 4. Powerful functions. No artistic skill is required. What you see is what you get. Create professional diagrams with minimum time loss for you. Automatically aligns and arranges everything to look great. 5. Beautiful style. Provide abundant arrow, line style, gradient fill and texture for each object. Predefined color scheme and style give your more creativity. 6. Work easily with other programs. With one-click buttons to import word, excel, equation files. Insert your EDraw charts into other document in just minutes. 7. XML file format. Save Common graphic format support and printing what your see is what you get. Enhanced export EMF, WMF, SVG, PDF, Html, Multiply tiff and SlideShow. 8. Smart connecting. Connecting the shapes with smart connecting lines that maintain flows and relationships easily. 9. Live update you will be notified once a new version or new templates are available for download. you can download the new version directly in the program. It's free for ever. 10. Great value for the money. See above information and user's reviews about EDraw Flowchart Software Create flow diagrams and org charts with minimum time loss!